I’m picturing Julia Child’s kitchen right now. I don’t have a good idea of the structural details, if the flooring is wood or linoleum or tile, how the cabinets were configured or what her refrigerator looked like when she was living at their “Roo de Loo” apartment in Paris in the late 1940’s and early ‘50’s. I’m just imagining a long counter lined with kitchen gadgets, copper pans, sieves and other shiny new cooking supplies bought from E. Dehillerin, her favorite Paris cookery shop. 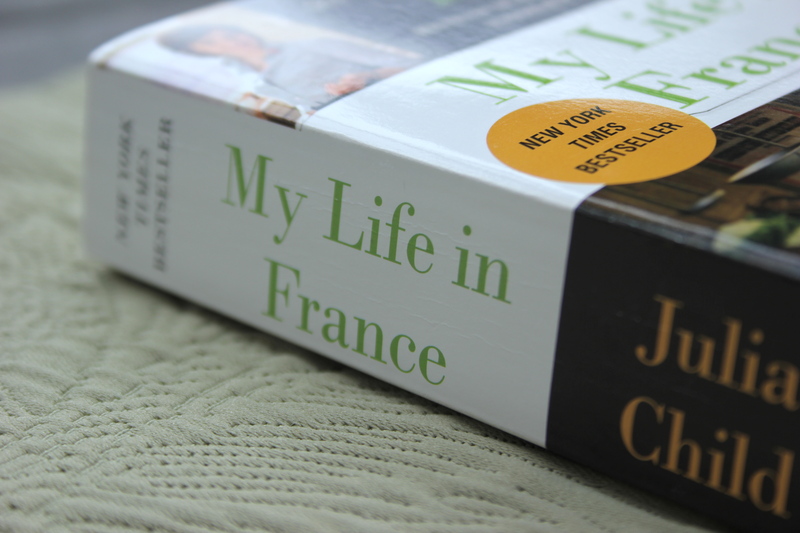 I’m reading My Life in France as part of the Tea & Cookies Book Club. The book itself, from a local bookstore, is as unappealing as they come (I was looking for a deal). It’s romance-novel sized and the book’s length and page size are out of proportion so it’s too thick – the thing keeps springing closed, especially when I’m trying to hold it open with one hand. But I’m so glad I didn’t judge it by its size or its Julie and Julia movie tie-in cover. It’s marvelous. It’s almost making me a convert to butter-only cooking. Her descriptions are so clear I was emboldened to make scrambled eggs according to her description of an early lesson she had during her time at Le Cordon Bleu: stirring minimally, sliding into melted butter in a skillet on very low heat and waiting a full three minutes before stirring (I tried but couldn’t stand it – I stirred after about a minute and a half). They were delicious. I’m missing vegetables, though. She cooks them, sure. But they’re almost always a complement to the beef or pork or bacon (or all three), used as decoration or as a butter-infused bed for something like a cooked partridge. Otherwise, it’s a lot of meat and potatoes. But I love reading about the start of her career and how she became a careful and dogged cook. Her enthusiasm is contagious – she tastes, experiments, tries again. (When she was testing her mayonnaise recipe, she ended up throwing whole batches down the toilet. Egads! They had more in the refrigerator than they could stand to eat.) I’m seeing how learning to pay attention to technique and flavor as she did will temper my haphazard habits in the kitchen. Don’t assume there’s enough salt. Focus, taste and practice, practice, practice. Last week our CSA box started up again. I forgot how much I missed fresh greens. The box included an especially beautiful bunch of lacinato kale so I decided to make a salad. I found this one and adapted it to incorporate some orphans in my pantry, namely a half-jar of black quinoa I never seem to get around to cooking. 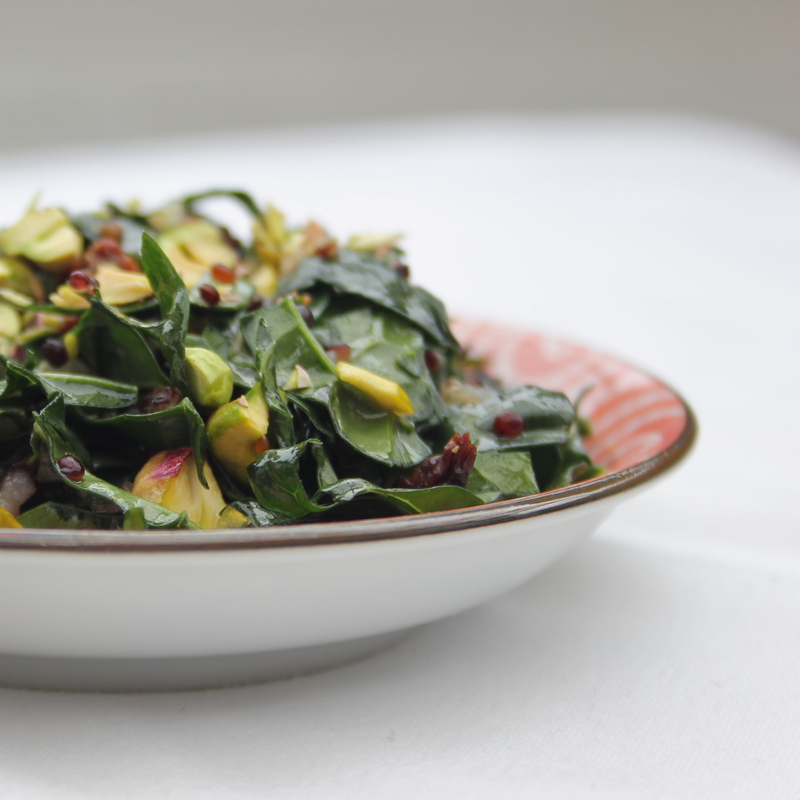 The result is a simple salad with texture, a vinegar punch and the contrasting greens of dark kale and chopped pistachios. No nod-to-Julia butter, but perfect for summer picnics. Add lemon juice, vinegar, olive oil, maple syrup and salt. 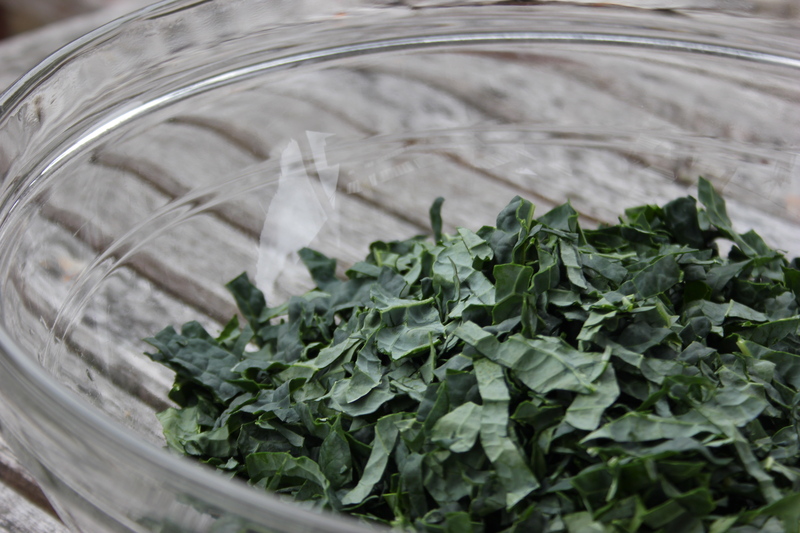 Massage into the kale and let sit while you prepare the other ingredients. 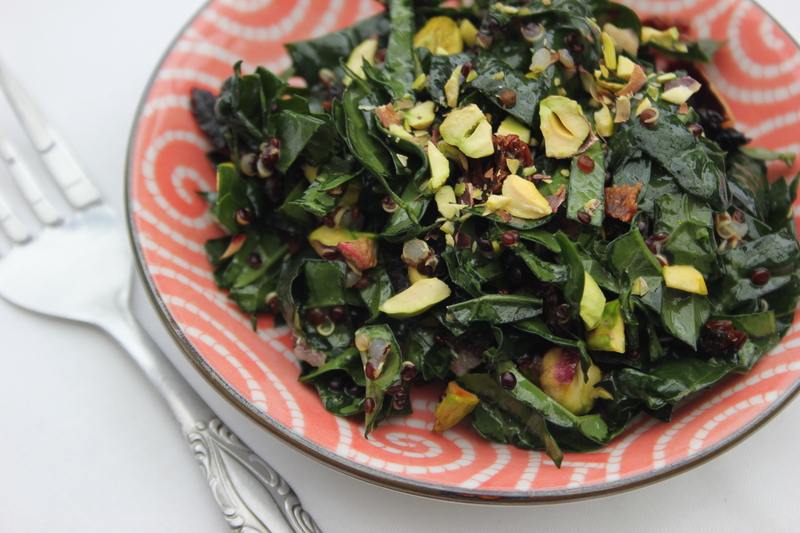 Add quinoa and all but a few chopped pistachios and dried cherries. 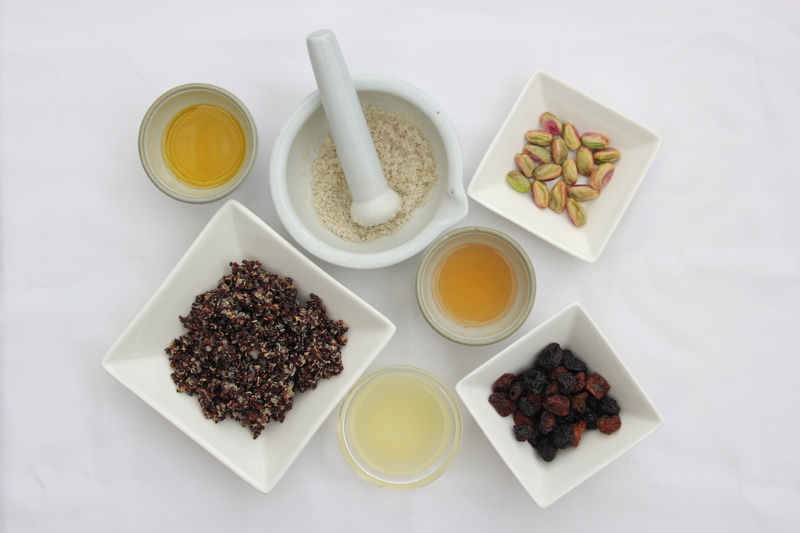 Toss to combine, arrange in a serving bowl and and sprinkle remaining pistachios and cherries on top. Did you know I’m a sci-fi fan? I am. I’m not a fanatic, but as a teen I watched Star Trek and as an adult I love reading anything written by Ursula K. LeGuin. Watching Battlestar Galactica is on my to-watch list. So, there’s my random fact, something the panel for this award requested from nominees, which is kind-of fun! As for my own shout-outs, here are five sites I find myself coming back to. 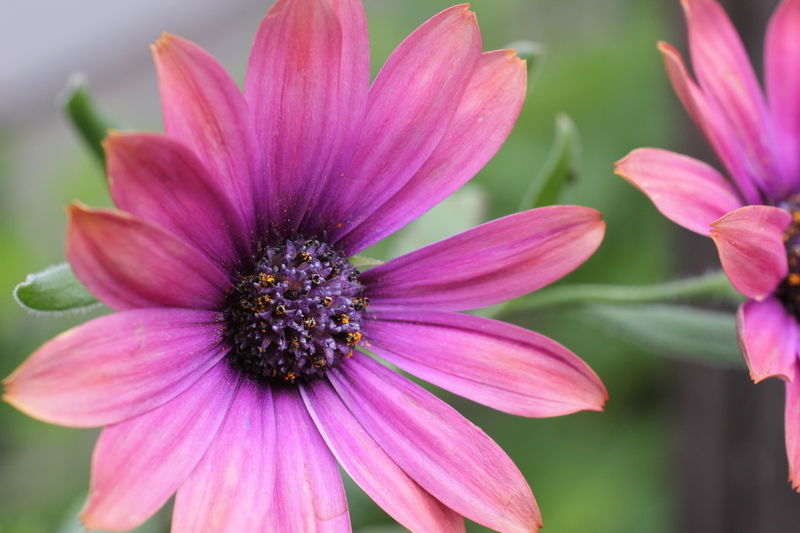 We’re grateful for the ways each of them contribute to the vibrant food community online. The blogging experience is richer because of what they do. Bon appetit! This entry was posted in Greens, Recipes, Spring Vegetables and tagged Cherry, Kale, Local, Organic, Salt. Bookmark the permalink. 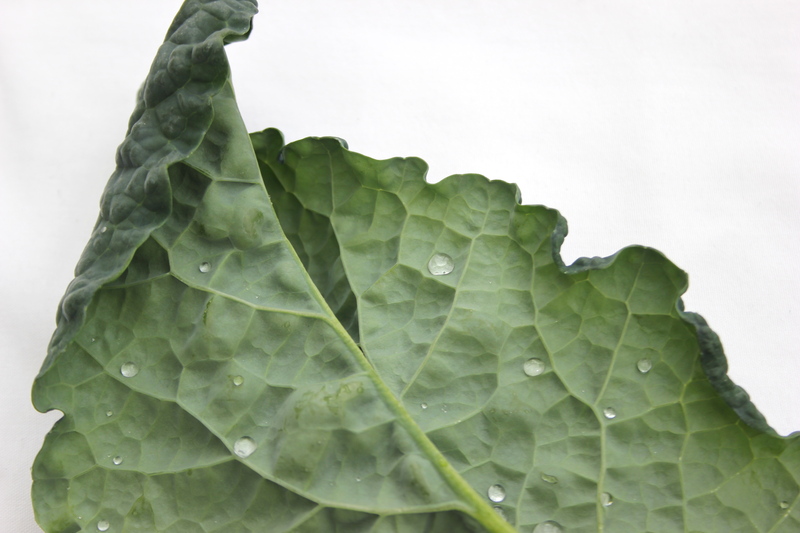 I like that first picture of the Kale leaf…and the salad looks beautiful! Thank you, Lilly Sue! I’m so glad you dropped by – happy eating! I love this book club idea! Congrats on your award, Jeni! Your photos in this post are especially delightful. I would love to know how you get your email subscribers (like me) to have to click to your actual blog to read the rest of the post. I’d really love to adjust mine to do the same. Happy Summer!